Opened in 2012, The Smith Center for the Performing Arts is one of the premier venues of its kind in Nevada. This contemporary entertainment complex is home to regional philharmonic and ballet organizations. You could also enjoy some popular Broadway shows at this performing arts hub that's conveniently located in Downtown Las Vegas. The LEED certification and the scenic Symphony Park highlight the world-class design of this popular entertainment hub. Click to book your Las Vegas show tickets. The exterior design is heavily inspired by the historic structures at the iconic Hoover Dam. David M. Schwarz was the chief architect of this world-class performing arts facility. The main tower at this complex has a charming Art Deco facade unlike anything else in Downtown Las Vegas. Click to book your Las Vegas show tickets. Featuring more than 2,000 seats on five different levels, Reynolds Hall is the premier facility at this acclaimed entertainment venue. This hall has a layout that's inspired by traditional opera theatres in other major American and European cities. Some of the seating sections include the Gallery, Dress Circle and Box Tier. The Mezzanine Lounge at Reynolds Hall serves light fare, such as sandwiches, snacks and salads. Occupying 3,700 sq feet, the much smaller Myron's Jazz Cabaret is set up to accommodate just more than 240 spectators. Artisan Bento boxes are available for sale if you'd like to satisfy some cravings while watching a show. Large enough for up to 250 people, the Troesh Studio Theater also offers an intimate setting for live entertainment. Before or after enjoying a show at The Smith Center for the Performing Arts, you could relax at the Symphony Park. Lined with beautiful palm trees and other manicured landscaping, this green space sometimes hosts outdoor concerts and other exciting events. You'll also see some contemporary art installations at this family-friendly urban park. Originally established in 1998, the Las Vegas Philharmonic has been officially based at The Smith Center for the Performing Arts since 2012. This organization performs some of the most recognizable symphonies in classical music. The philharmonic also participates in special concerts during some holidays, such as Christmas. The Nevada Ballet Theatre is another entity that's proudly headquartered at this performing arts facility. Some of the ballet company's popular shows include Dracula, the Nutcracker and Firebird. Additionally, freestyle ballet and other contemporary dance sessions are performed by the organization. Throughout the year, the arena hosts various off-Broadway shows that are part of international tours. The School of Rock, Lion King and Fiddler on the Roof are some of the productions that have been performed at this premier complex in Downtown Las Vegas. 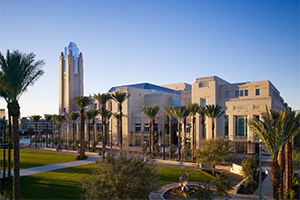 The Smith Center for the Performing Arts is located in the historic Downtown Las Vegas district. Rail tracks separate this entertainment venue from the busy downtown district, so you'll need to use Bonneville Avenue or Ogden Avenue to access the parking lot. Interstate 15 merges with the Las Vegas Expressway just north of the indoor arena. Both highways link Las Vegas with several neighbouring communities in southern Nevada. The Regional Transportation Commission (RTC) manages several bus routes that drop off passengers within walking distance of the performing arts centre. When searching for this venue, you could use the Clark County Government Center and Las Vegas North Premium Outlets for reference. Additionally, the Discovery Children's Museum is part of the same annex that encompasses the performance halls and theatres. Click here to visit The Smith Center for the Performing Arts official website.